All Tipi Top and Bottom Skirt designs are available in the antique wash style or the solid color style. Tipi Top and Bottom Skirt prices for our 22ft tipis are more expensive than quoted on our artwork pricelist because our 22ft tipis are extremely large and require extra handling on the floor. Please see the artwork pricelist for exact prices for each tipi size. Price depends on tipi size. Please refer to the artwork pricelist. The Seven Sisters (the star cluster Pleiades) has had mythological importance for many tribes and cultures. Price depends on tipi size. Please refer to the artwork pricelist. This top design was believed to bring powerful dreams to the lodge owner. It may be painted in any color combination you like. The Morning Star (#38) may also be used by itself anywhere else on the tipi. These are the yellow and black stripes below the top design. They are derived from a Blackfoot dream legend.Each stripe is priced separately. Symbolized by a band of circles around the top. This design is 4′ in diameter. Like the design Black Hills-single balls, but the number of circles in the design have been doubled. Plains tipis often showed this additional complexity which animated the visual beauty of the design. Please refer to artwork pricelist. Choose any color combination you like. Price depends on tipi size. Please refer to the artwork pricelist. Choose any color or style you like. Price: Please see artwork pricelist. Same Symbol as in Top #44, but this time painted on the tipi canvas by itself. It originated from a dream in which the dreamer had taken the form of an eagle and as he soared higher and higher this was the symbolic appearance of the rivers and mesas beneath him. Two blue bands and a tan band with terracotta circles. Two rows of blue circles. Add on one additional row if you like. Price: Please refer to the artwork pricelist. This symbol is very classical and was thought to enhance powerful dreams. The animal silhouettes in black with their red spirit lines are particularly striking on the tan color fabric. Each firgure priced separately. Please refer to the artwork pricelist. 4 bands which seems to support the sky and blend with it. The Spirit Dancers are encircling and protecting the whole tipi with their mystical power. Their ancient magic seems to penetrate through the tipi itself and they can be felt inside at night moving and swaying in ritual silence around the evening fire. Each dancer is priced separately. Please refer to the artwork pricelist. These spirit circles are left unpainted against their background. This allows the sunlight and moonlight to shine through, creating a unique visual effect much like the stained glass lightning in the top of a cathedral. Historical accounts say that after a tipe was made it was first set up wrong side out. It was sealed up tight and then a large smoky fire was built inside. The soot and tars from the smoke would coat the buffalo hide and make it totally waterproof and help preserve the leather. Please refer to the artwork pricelist. The Four Direction Designs themselves are left unpainted so that from the inside of the tipi they show up as “Daylight Stars” in the sky. At night with the tipi light from inside they appear as twinkling stars dancing about the top of the tipi cover. A tribute to the solar dance of the Earth, the Moon, and the Sun. This Tipi Design tells the mythical story of a shaman’s journey. 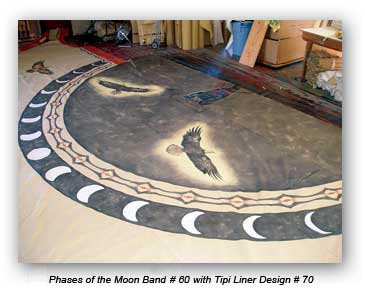 The journey begins in the earth plane represented by the Black Hills bottom skirt design. The two small star motifs in the second set of balls to the left of the door hole pay homage to the sacred Peyote plant.The open”fingers” at the ends of the Black Hills design signify that the veil of the earth plane has been penetrated and the shaman’s journey has begun its assent to the upper realms of the spiritual world. The red pinning stripe is the path of the journey. The next phase passes through the celestial domain represented by the Many Moons band. Next, the shaman passes through the “rattlesnake” band which signifies the deep trust that all life is protected and renewed by Mother Earth – Pachamama. At this point the shaman has traveled to the edge of the Great Mystery which is the home of the Great Spirit. Here all life forms, represented by the pyramid of white balls, begin their journey downward to physical existence on the earth. In the realm of the Great Mystery the shaman receives the instruction and training that he will need to serve as the spiritual teacher for his people. 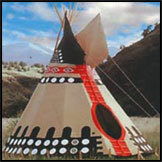 The Ceremonial Tipi Design is offered only as pictured. Please refer to the artwork pricelist for prices per tipi size.